‘Tis gift giving time! I’m already getting hints from friends and family about what to get them for the holidays and it’s not even December yet! I do, however, suppose it is best to start early before I find myself waiting in lines 25 people deep surrounded by screaming children and disgruntled New Yorkers. Ah, the joy of the holidays. I can’t tell you how many times I’ve found myself out for a run or walking the dog wishing I had a yoga mat. I can’t be the only one! 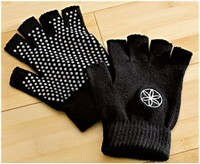 These Gaiam gloves solve the problem for only $9.98. Your lucky friend can practice any time, anywhere, without worrying about their hands slipping out from underneath them while pulling a full wheel on a park bench. 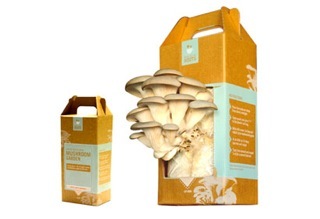 Back to the Roots’ at-home mushroom garden is an excellent gift for the foodie in your life. The first crop grows in as little as 10 days and can be grown indoors, simply and easily. I received one of these little boxes o’joy over the summer and, let me tell you, it’s the gift that keeps on giving, literally. Sharon Gannon and David Life give an excellent overview of both the physical and spiritual practice of yoga and delve deep into topics like ahimsa and bhakti in this timeless book. I’ve read and re-read it numerous times and lended it to many friends. Everyone raves about it. It’s the perfect gift for any yogi no matter where they are in the development of their practice. 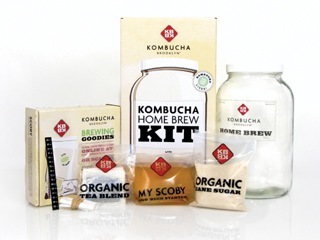 Who doesn’t love kombucha? Every week, I look forward to stopping by the Kombucha Brooklyn stand at my local farmers market for a glass of their effervescent goodness. A couple of weeks ago they had a Balsam flavor that knocked my socks off. Now, your yoga buddies can make it right in their own homes with this handy kit. I can think of 5 people off the top of my head that I already know would L-O-V-E this! And here are some more general ideas for gifts. If you’ve got a yoga lover in your midst, one of these might be just the right stocking stuffer. Stuffers vary in size. Enjoy! If you’ve been telling yourself that your ratty, stained, slightly smelly polyurethane mat you got in a garage sale years ago is still fine, I’m here to intervene. That’s kind of like a marathon runner in 10 year-old sneakers. Why not invest in a mat that cares about your experience? You have your pick of choices, from eco-friendly to non-slippery and comfy Cadillac-type mats these days. I admit I’m a bookworm when it comes to yoga reading material, and there are so many awesome books to help deepen your knowledge and exploration of the practice in your life (See my column on some great yoga books). Whether this is one of your own creation (remember mix tapes?) or if you came across an album of great music, this will always be a winner for the music loving yogi. I used to think this was a luxury, and by all means you don’t always need a special seat for meditating, but what better way to say you mean business then by cultivating a space at home with a comfy seat for your comfy seat? Plus, these cushions are versatile as they can also offer more seating options for friendly gatherings. If you’re usually a vigorous Vinyasa-type person, this awesome yoga prop can offer a great opportunity for yummy calming and supported poses. Not only is this an excuse to develop your restorative home practice, but it also encourages you to treat yourself to mini retreats from the ease of your own home. This is one of my favorite gifts, because it gives you a chance to have a one-on-one session with a favorite, knowledgeable teacher; you can ask questions and learn more about modifying the practice to your specific needs. What more do you need? This great stocking stuffer doesn’t really need an explanation, as it’s kind of sweet to give you or a friend more chances for yoga. And if you’re considering the online route, DoYouYoga has a bunch of awesome courses for yogis of all practice levels. Check them out here.